For other uses, see Muscle (disambiguation). Muscle is a soft tissue found in most animals. Muscle cells contain protein filaments of actin and myosin that slide past one another, producing a contraction that changes both the length and the shape of the cell. Muscles function to produce force and motion. They are primarily responsible for maintaining and changing posture, locomotion, as well as movement of internal organs, such as the contraction of the heart and the movement of food through the digestive system via peristalsis. Muscle tissues are derived from the mesodermal layer of embryonic germ cells in a process known as myogenesis. There are three types of muscle, skeletal or striated, cardiac, and smooth. Muscle action can be classified as being either voluntary or involuntary. Cardiac and smooth muscles contract without conscious thought and are termed involuntary, whereas the skeletal muscles contract upon command. Skeletal muscles in turn can be divided into fast and slow twitch fibers. Muscles are predominantly powered by the oxidation of fats and carbohydrates, but anaerobic chemical reactions are also used, particularly by fast twitch fibers. These chemical reactions produce adenosine triphosphate (ATP) molecules that are used to power the movement of the myosin heads. The term muscle is derived from the Latin musculus meaning "little mouse" perhaps because of the shape of certain muscles or because contracting muscles look like mice moving under the skin. The anatomy of muscles includes gross anatomy, which comprises all the muscles of an organism, and microanatomy, which comprises the structures of a single muscle. Skeletal muscle or "voluntary muscle" is anchored by tendons (or by aponeuroses at a few places) to bone and is used to effect skeletal movement such as locomotion and in maintaining posture. Though this postural control is generally maintained as an unconscious reflex, the muscles responsible react to conscious control like non-postural muscles. An average adult male is made up of 42% of skeletal muscle and an average adult female is made up of 36% (as a percentage of body mass). Smooth muscle or "involuntary muscle" is found within the walls of organs and structures such as the esophagus, stomach, intestines, bronchi, uterus, urethra, bladder, blood vessels, and the arrector pili in the skin (in which it controls erection of body hair). Unlike skeletal muscle, smooth muscle is not under conscious control. Cardiac muscle (myocardium), is also an "involuntary muscle" but is more akin in structure to skeletal muscle, and is found only in the heart. Cardiac and skeletal muscles are "striated" in that they contain sarcomeres that are packed into highly regular arrangements of bundles; the myofibrils of smooth muscle cells are not arranged in sarcomeres and so are not striated. While the sarcomeres in skeletal muscles are arranged in regular, parallel bundles, cardiac muscle sarcomeres connect at branching, irregular angles (called intercalated discs). Striated muscle contracts and relaxes in short, intense bursts, whereas smooth muscle sustains longer or even near-permanent contractions. Type I, slow twitch, or "red" muscle, is dense with capillaries and is rich in mitochondria and myoglobin, giving the muscle tissue its characteristic red color. It can carry more oxygen and sustain aerobic activity using fats or carbohydrates as fuel. Slow twitch fibers contract for long periods of time but with little force. Type II, fast twitch muscle, has three major subtypes (IIa, IIx, and IIb) that vary in both contractile speed and force generated. Fast twitch fibers contract quickly and powerfully but fatigue very rapidly, sustaining only short, anaerobic bursts of activity before muscle contraction becomes painful. They contribute most to muscle strength and have greater potential for increase in mass. Type IIb is anaerobic, glycolytic, "white" muscle that is least dense in mitochondria and myoglobin. In small animals (e.g., rodents) this is the major fast muscle type, explaining the pale color of their flesh. The density of mammalian skeletal muscle tissue is about 1.06 kg/liter. This can be contrasted with the density of adipose tissue (fat), which is 0.9196 kg/liter. This makes muscle tissue approximately 15% denser than fat tissue. A skeletal muscle fiber is surrounded by a plasma membrane called the sarcolemma, which contains sarcoplasm, the cytoplasm of muscle cells. A muscle fiber is composed of many fibrils, which give the cell its striated appearance. Skeletal muscles are sheathed by a tough layer of connective tissue called the epimysium. The epimysium anchors muscle tissue to tendons at each end, where the epimysium becomes thicker and collagenous. It also protects muscles from friction against other muscles and bones. Within the epimysium are multiple bundles called fascicles, each of which contains 10 to 100 or more muscle fibers collectively sheathed by a perimysium. Besides surrounding each fascicle, the perimysium is a pathway for nerves and the flow of blood within the muscle. The threadlike muscle fibers are the individual muscle cells (myocytes), and each cell is encased within its own endomysium of collagen fibers. Thus, the overall muscle consists of fibers (cells) that are bundled into fascicles, which are themselves grouped together to form muscles. At each level of bundling, a collagenous membrane surrounds the bundle, and these membranes support muscle function both by resisting passive stretching of the tissue and by distributing forces applied to the muscle. Scattered throughout the muscles are muscle spindles that provide sensory feedback information to the central nervous system. (This grouping structure is analogous to the organization of nerves which uses epineurium, perineurium, and endoneurium). This same bundles-within-bundles structure is replicated within the muscle cells. Within the cells of the muscle are myofibrils, which themselves are bundles of protein filaments. The term "myofibril" should not be confused with "myofiber", which is a simply another name for a muscle cell. Myofibrils are complex strands of several kinds of protein filaments organized together into repeating units called sarcomeres. 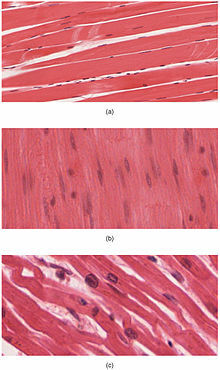 The striated appearance of both skeletal and cardiac muscle results from the regular pattern of sarcomeres within their cells. Although both of these types of muscle contain sarcomeres, the fibers in cardiac muscle are typically branched to form a network. Cardiac muscle fibers are interconnected by intercalated discs, giving that tissue the appearance of a syncytium. The filaments in a sarcomere are composed of actin and myosin. Bundles of muscle fibers, called fascicles, are covered by the perimysium. Muscle fibers are covered by the endomysium. The gross anatomy of a muscle is the most important indicator of its role in the body. There is an important distinction seen between pennate muscles and other muscles. 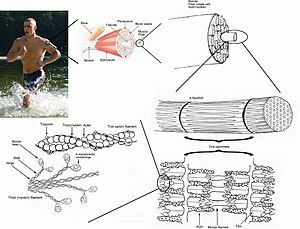 In most muscles, all the fibers are oriented in the same direction, running in a line from the origin to the insertion. However, In pennate muscles, the individual fibers are oriented at an angle relative to the line of action, attaching to the origin and insertion tendons at each end. Because the contracting fibers are pulling at an angle to the overall action of the muscle, the change in length is smaller, but this same orientation allows for more fibers (thus more force) in a muscle of a given size. Pennate muscles are usually found where their length change is less important than maximum force, such as the rectus femoris. Skeletal muscle is arranged in discrete muscles, an example of which is the biceps brachii (biceps). The tough, fibrous epimysium of skeletal muscle is both connected to and continuous with the tendons. In turn, the tendons connect to the periosteum layer surrounding the bones, permitting the transfer of force from the muscles to the skeleton. Together, these fibrous layers, along with tendons and ligaments, constitute the deep fascia of the body. On the anterior and posterior views of the muscular system above, superficial muscles (those at the surface) are shown on the right side of the body while deep muscles (those underneath the superficial muscles) are shown on the left half of the body. For the legs, superficial muscles are shown in the anterior view while the posterior view shows both superficial and deep muscles. The muscular system consists of all the muscles present in a single body. There are approximately 650 skeletal muscles in the human body, but an exact number is difficult to define. The difficulty lies partly in the fact that different sources group the muscles differently and partly in that some muscles, such as palmaris longus, are not always present. A muscular slip is a narrow length of muscle that acts to augment a larger muscle or muscles. The muscular system is one component of the musculoskeletal system, which includes not only the muscles but also the bones, joints, tendons, and other structures that permit movement. A chicken embryo, showing the paraxial mesoderm on both sides of the neural fold. The anterior (forward) portion has begun to form somites (labeled "primitive segments"). All muscles are derived from paraxial mesoderm. The paraxial mesoderm is divided along the embryo's length into somites, corresponding to the segmentation of the body (most obviously seen in the vertebral column. Each somite has 3 divisions, sclerotome (which forms vertebrae), dermatome (which forms skin), and myotome (which forms muscle). The myotome is divided into two sections, the epimere and hypomere, which form epaxial and hypaxial muscles, respectively. The only epaxial muscles in humans are the erector spinae and small intervertebral muscles, and are innervated by the dorsal rami of the spinal nerves. All other muscles, including those of the limbs are hypaxial, and inervated by the ventral rami of the spinal nerves. During development, myoblasts (muscle progenitor cells) either remain in the somite to form muscles associated with the vertebral column or migrate out into the body to form all other muscles. Myoblast migration is preceded by the formation of connective tissue frameworks, usually formed from the somatic lateral plate mesoderm. Myoblasts follow chemical signals to the appropriate locations, where they fuse into elongate skeletal muscle cells. The three types of muscle (skeletal, cardiac and smooth) have significant differences. However, all three use the movement of actin against myosin to create contraction. In skeletal muscle, contraction is stimulated by electrical impulses transmitted by the nerves, the motoneurons (motor nerves) in particular. Cardiac and smooth muscle contractions are stimulated by internal pacemaker cells which regularly contract, and propagate contractions to other muscle cells they are in contact with. All skeletal muscle and many smooth muscle contractions are facilitated by the neurotransmitter acetylcholine. When a sarcomere contracts, the Z lines move closer together, and the I band becomes smaller. The A band stays the same width. At full contraction, the thin and thick filaments overlap. The action a muscle generates is determined by the origin and insertion locations. The cross-sectional area of a muscle (rather than volume or length) determines the amount of force it can generate by defining the number of "sarcomeres" which can operate in parallel. 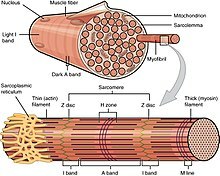 Each skeletal muscle contains long units called myofibrils, and each myofibril is a chain of sarcomeres. Since contraction occurs at the same time for all connected sarcomeres in a muscles cell, these chains of sarcomeres shorten together, thus shortening the muscle fiber, resulting in overall length change. The amount of force applied to the external environment is determined by lever mechanics, specifically the ratio of in-lever to out-lever. For example, moving the insertion point of the biceps more distally on the radius (farther from the joint of rotation) would increase the force generated during flexion (and, as a result, the maximum weight lifted in this movement), but decrease the maximum speed of flexion. Moving the insertion point proximally (closer to the joint of rotation) would result in decreased force but increased velocity. This can be most easily seen by comparing the limb of a mole to a horse—in the former, the insertion point is positioned to maximize force (for digging), while in the latter, the insertion point is positioned to maximize speed (for running). Simplified schema of basic nervous system function. Signals are picked up by sensory receptors and sent to the spinal cord and brain via the afferent leg of the peripheral nervous system, whereupon processing occurs that results in signals sent back to the spinal cord and then out to motor neurons via the efferent leg. The efferent leg of the peripheral nervous system is responsible for conveying commands to the muscles and glands, and is ultimately responsible for voluntary movement. Nerves move muscles in response to voluntary and autonomic (involuntary) signals from the brain. Deep muscles, superficial muscles, muscles of the face and internal muscles all correspond with dedicated regions in the primary motor cortex of the brain, directly anterior to the central sulcus that divides the frontal and parietal lobes. In addition, muscles react to reflexive nerve stimuli that do not always send signals all the way to the brain. In this case, the signal from the afferent fiber does not reach the brain, but produces the reflexive movement by direct connections with the efferent nerves in the spine. However, the majority of muscle activity is volitional, and the result of complex interactions between various areas of the brain. Nerves that control skeletal muscles in mammals correspond with neuron groups along the primary motor cortex of the brain's cerebral cortex. Commands are routed though the basal ganglia and are modified by input from the cerebellum before being relayed through the pyramidal tract to the spinal cord and from there to the motor end plate at the muscles. Along the way, feedback, such as that of the extrapyramidal system contribute signals to influence muscle tone and response. Deeper muscles such as those involved in posture often are controlled from nuclei in the brain stem and basal ganglia. In skeletal muscles, muscle spindles convey information about the degree of muscle length and stretch to the central nervous system to assist in maintaining posture and joint position. The sense of where our bodies are in space is called proprioception, the perception of body awareness, the "unconscious" awareness of where the various regions of the body are located at any one time. Several areas in the brain coordinate movement and position with the feedback information gained from proprioception. The cerebellum and red nucleus in particular continuously sample position against movement and make minor corrections to assure smooth motion. (a) Some ATP is stored in a resting muscle. As contraction starts, it is used up in seconds. More ATP is generated from creatine phosphate for about 15 seconds. (b) Each glucose molecule produces two ATP and two molecules of pyruvic acid, which can be used in aerobic respiration or converted to lactic acid. If oxygen is not available, pyruvic acid is converted to lactic acid, which may contribute to muscle fatigue. This occurs during strenuous exercise when high amounts of energy are needed but oxygen cannot be sufficiently delivered to muscle. (c) Aerobic respiration is the breakdown of glucose in the presence of oxygen (O2) to produce carbon dioxide, water, and ATP. Approximately 95 percent of the ATP required for resting or moderately active muscles is provided by aerobic respiration, which takes place in mitochondria. Muscular activity accounts for much of the body's energy consumption. All muscle cells produce adenosine triphosphate (ATP) molecules which are used to power the movement of the myosin heads. Muscles have a short-term store of energy in the form of creatine phosphate which is generated from ATP and can regenerate ATP when needed with creatine kinase. Muscles also keep a storage form of glucose in the form of glycogen. Glycogen can be rapidly converted to glucose when energy is required for sustained, powerful contractions. Within the voluntary skeletal muscles, the glucose molecule can be metabolized anaerobically in a process called glycolysis which produces two ATP and two lactic acid molecules in the process (note that in aerobic conditions, lactate is not formed; instead pyruvate is formed and transmitted through the citric acid cycle). Muscle cells also contain globules of fat, which are used for energy during aerobic exercise. 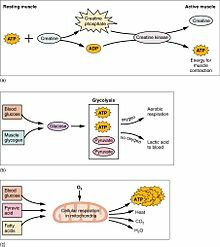 The aerobic energy systems take longer to produce the ATP and reach peak efficiency, and requires many more biochemical steps, but produces significantly more ATP than anaerobic glycolysis. Cardiac muscle on the other hand, can readily consume any of the three macronutrients (protein, glucose and fat) aerobically without a 'warm up' period and always extracts the maximum ATP yield from any molecule involved. The heart, liver and red blood cells will also consume lactic acid produced and excreted by skeletal muscles during exercise. At rest, skeletal muscle consumes 54.4 kJ/kg (13.0 kcal/kg) per day. This is larger than adipose tissue (fat) at 18.8 kJ/kg (4.5 kcal/kg), and bone at 9.6 kJ/kg (2.3 kcal/kg). The efficiency of human muscle has been measured (in the context of rowing and cycling) at 18% to 26%. The efficiency is defined as the ratio of mechanical work output to the total metabolic cost, as can be calculated from oxygen consumption. This low efficiency is the result of about 40% efficiency of generating ATP from food energy, losses in converting energy from ATP into mechanical work inside the muscle, and mechanical losses inside the body. The latter two losses are dependent on the type of exercise and the type of muscle fibers being used (fast-twitch or slow-twitch). For an overall efficiency of 20 percent, one watt of mechanical power is equivalent to 4.3 kcal per hour. For example, one manufacturer of rowing equipment calibrates its rowing ergometer to count burned calories as equal to four times the actual mechanical work, plus 300 kcal per hour, this amounts to about 20 percent efficiency at 250 watts of mechanical output. The mechanical energy output of a cyclic contraction can depend upon many factors, including activation timing, muscle strain trajectory, and rates of force rise & decay. These can be synthesized experimentally using work loop analysis. Muscle is a result of three factors that overlap: physiological strength (muscle size, cross sectional area, available crossbridging, responses to training), neurological strength (how strong or weak is the signal that tells the muscle to contract), and mechanical strength (muscle's force angle on the lever, moment arm length, joint capabilities). Vertebrate muscle typically produces approximately 25–33 N (5.6–7.4 lbf) of force per square centimeter of muscle cross-sectional area when isometric and at optimal length. Some invertebrate muscles, such as in crab claws, have much longer sarcomeres than vertebrates, resulting in many more sites for actin and myosin to bind and thus much greater force per square centimeter at the cost of much slower speed. The force generated by a contraction can be measured non-invasively using either mechanomyography or phonomyography, be measured in vivo using tendon strain (if a prominent tendon is present), or be measured directly using more invasive methods. The strength of any given muscle, in terms of force exerted on the skeleton, depends upon length, shortening speed, cross sectional area, pennation, sarcomere length, myosin isoforms, and neural activation of motor units. Significant reductions in muscle strength can indicate underlying pathology, with the chart at right used as a guide. Since three factors affect muscular strength simultaneously and muscles never work individually, it is misleading to compare strength in individual muscles, and state that one is the "strongest". But below are several muscles whose strength is noteworthy for different reasons. In ordinary parlance, muscular "strength" usually refers to the ability to exert a force on an external object—for example, lifting a weight. By this definition, the masseter or jaw muscle is the strongest. The 1992 Guinness Book of Records records the achievement of a bite strength of 4,337 N (975 lbf) for 2 seconds. What distinguishes the masseter is not anything special about the muscle itself, but its advantage in working against a much shorter lever arm than other muscles. If "strength" refers to the force exerted by the muscle itself, e.g., on the place where it inserts into a bone, then the strongest muscles are those with the largest cross-sectional area. This is because the tension exerted by an individual skeletal muscle fiber does not vary much. Each fiber can exert a force on the order of 0.3 micronewton. By this definition, the strongest muscle of the body is usually said to be the quadriceps femoris or the gluteus maximus. Because muscle strength is determined by cross-sectional area, a shorter muscle will be stronger "pound for pound" (i.e., by weight) than a longer muscle of the same cross-sectional area. The myometrial layer of the uterus may be the strongest muscle by weight in the female human body. At the time when an infant is delivered, the entire human uterus weighs about 1.1 kg (40 oz). During childbirth, the uterus exerts 100 to 400 N (25 to 100 lbf) of downward force with each contraction. The external muscles of the eye are conspicuously large and strong in relation to the small size and weight of the eyeball. It is frequently said that they are "the strongest muscles for the job they have to do" and are sometimes claimed to be "100 times stronger than they need to be." However, eye movements (particularly saccades used on facial scanning and reading) do require high speed movements, and eye muscles are exercised nightly during rapid eye movement sleep. The statement that "the tongue is the strongest muscle in the body" appears frequently in lists of surprising facts, but it is difficult to find any definition of "strength" that would make this statement true. Note that the tongue consists of eight muscles, not one. The heart has a claim to being the muscle that performs the largest quantity of physical work in the course of a lifetime. Estimates of the power output of the human heart range from 1 to 5 watts. This is much less than the maximum power output of other muscles; for example, the quadriceps can produce over 100 watts, but only for a few minutes. The heart does its work continuously over an entire lifetime without pause, and thus does "outwork" other muscles. An output of one watt continuously for eighty years yields a total work output of two and a half gigajoules. Jogging is one form of aerobic exercise. Exercise is often recommended as a means of improving motor skills, fitness, muscle and bone strength, and joint function. Exercise has several effects upon muscles, connective tissue, bone, and the nerves that stimulate the muscles. One such effect is muscle hypertrophy, an increase in size. This is used in bodybuilding. Various exercises require a predominance of certain muscle fiber utilization over another. Aerobic exercise involves long, low levels of exertion in which the muscles are used at well below their maximal contraction strength for long periods of time (the most classic example being the marathon). Aerobic events, which rely primarily on the aerobic (with oxygen) system, use a higher percentage of Type I (or slow-twitch) muscle fibers, consume a mixture of fat, protein and carbohydrates for energy, consume large amounts of oxygen and produce little lactic acid. Anaerobic exercise involves short bursts of higher intensity contractions at a much greater percentage of their maximum contraction strength. Examples of anaerobic exercise include sprinting and weight lifting. The anaerobic energy delivery system uses predominantly Type II or fast-twitch muscle fibers, relies mainly on ATP or glucose for fuel, consumes relatively little oxygen, protein and fat, produces large amounts of lactic acid and can not be sustained for as long a period as aerobic exercise. Many exercises are partially aerobic and partially anaerobic; for example, soccer and rock climbing involve a combination of both. The presence of lactic acid has an inhibitory effect on ATP generation within the muscle; though not producing fatigue, it can inhibit or even stop performance if the intracellular concentration becomes too high. However, long-term training causes neovascularization within the muscle, increasing the ability to move waste products out of the muscles and maintain contraction. Once moved out of muscles with high concentrations within the sarcomere, lactic acid can be used by other muscles or body tissues as a source of energy, or transported to the liver where it is converted back to pyruvate. In addition to increasing the level of lactic acid, strenuous exercise causes the loss of potassium ions in muscle and causing an increase in potassium ion concentrations close to the muscle fibres, in the interstitium. Acidification by lactic acid may allow recovery of force so that acidosis may protect against fatigue rather than being a cause of fatigue. Delayed onset muscle soreness is pain or discomfort that may be felt one to three days after exercising and generally subsides two to three days later. Once thought to be caused by lactic acid build-up, a more recent theory is that it is caused by tiny tears in the muscle fibers caused by eccentric contraction, or unaccustomed training levels. Since lactic acid disperses fairly rapidly, it could not explain pain experienced days after exercise. Independent of strength and performance measures, muscles can be induced to grow larger by a number of factors, including hormone signaling, developmental factors, strength training, and disease. Contrary to popular belief, the number of muscle fibres cannot be increased through exercise. Instead, muscles grow larger through a combination of muscle cell growth as new protein filaments are added along with additional mass provided by undifferentiated satellite cells alongside the existing muscle cells. Biological factors such as age and hormone levels can affect muscle hypertrophy. During puberty in males, hypertrophy occurs at an accelerated rate as the levels of growth-stimulating hormones produced by the body increase. Natural hypertrophy normally stops at full growth in the late teens. As testosterone is one of the body's major growth hormones, on average, men find hypertrophy much easier to achieve than women. Taking additional testosterone or other anabolic steroids will increase muscular hypertrophy. Muscular, spinal and neural factors all affect muscle building. Sometimes a person may notice an increase in strength in a given muscle even though only its opposite has been subject to exercise, such as when a bodybuilder finds her left biceps stronger after completing a regimen focusing only on the right biceps. This phenomenon is called cross education. Prisoner of war exhibiting muscle loss as a result of malnutrition. Muscles may atrophy as a result of malnutrition, physical inactivity, aging, or disease. Inactivity and starvation in mammals lead to atrophy of skeletal muscle, a decrease in muscle mass that may be accompanied by a smaller number and size of the muscle cells as well as lower protein content. Muscle atrophy may also result from the natural aging process or from disease. In humans, prolonged periods of immobilization, as in the cases of bed rest or astronauts flying in space, are known to result in muscle weakening and atrophy. Atrophy is of particular interest to the manned spaceflight community, because the weightlessness experienced in spaceflight results is a loss of as much as 30% of mass in some muscles. Such consequences are also noted in small hibernating mammals like the golden-mantled ground squirrels and brown bats. During aging, there is a gradual decrease in the ability to maintain skeletal muscle function and mass, known as sarcopenia. The exact cause of sarcopenia is unknown, but it may be due to a combination of the gradual failure in the "satellite cells" that help to regenerate skeletal muscle fibers, and a decrease in sensitivity to or the availability of critical secreted growth factors that are necessary to maintain muscle mass and satellite cell survival. Sarcopenia is a normal aspect of aging, and is not actually a disease state yet can be linked to many injuries in the elderly population as well as decreasing quality of life. There are also many diseases and conditions that cause muscle atrophy. Examples include cancer and AIDS, which induce a body wasting syndrome called cachexia. Other syndromes or conditions that can induce skeletal muscle atrophy are congestive heart disease and some diseases of the liver. In muscular dystrophy, the affected tissues become disorganized and the concentration of dystrophin (green) is greatly reduced. Neuromuscular diseases are those that affect the muscles and/or their nervous control. In general, problems with nervous control can cause spasticity or paralysis, depending on the location and nature of the problem. A large proportion of neurological disorders, ranging from cerebrovascular accident (stroke) and Parkinson's disease to Creutzfeldt–Jakob disease, can lead to problems with movement or motor coordination. Symptoms of muscle diseases may include weakness, spasticity, myoclonus and myalgia. Diagnostic procedures that may reveal muscular disorders include testing creatine kinase levels in the blood and electromyography (measuring electrical activity in muscles). In some cases, muscle biopsy may be done to identify a myopathy, as well as genetic testing to identify DNA abnormalities associated with specific myopathies and dystrophies. A non-invasive elastography technique that measures muscle noise is undergoing experimentation to provide a way of monitoring neuromuscular disease. The sound produced by a muscle comes from the shortening of actomyosin filaments along the axis of the muscle. During contraction, the muscle shortens along its longitudinal axis and expands across the transverse axis, producing vibrations at the surface. The evolutionary origin of muscle cells in metazoans is a highly debated topic. In one line of thought scientists have believed that muscle cells evolved once and thus all animals with muscles cells have a single common ancestor. In the other line of thought, scientists believe muscles cells evolved more than once and any morphological or structural similarities are due to convergent evolution and genes that predate the evolution of muscle and even the mesoderm—the germ layer from which many scientists believe true muscle cells derive. Schmid and Seipel argue that the origin of muscle cells is a monophyletic trait that occurred concurrently with the development of the digestive and nervous systems of all animals and that this origin can be traced to a single metazoan ancestor in which muscle cells are present. They argue that molecular and morphological similarities between the muscles cells in cnidaria and ctenophora are similar enough to those of bilaterians that there would be one ancestor in metazoans from which muscle cells derive. In this case, Schmid and Seipel argue that the last common ancestor of bilateria, ctenophora, and cnidaria was a triploblast or an organism with three germ layers and that diploblasty, meaning an organism with two germ layers, evolved secondarily due to their observation of the lack of mesoderm or muscle found in most cnidarians and ctenophores. By comparing the morphology of cnidarians and ctenophores to bilaterians, Schmid and Seipel were able to conclude that there were myoblast-like structures in the tentacles and gut of some species of cnidarians and in the tentacles of ctenophores. Since this is a structure unique to muscle cells, these scientists determined based on the data collected by their peers that this is a marker for striated muscles similar to that observed in bilaterians. The authors also remark that the muscle cells found in cnidarians and ctenophores are often contests due to the origin of these muscle cells being the ectoderm rather than the mesoderm or mesendoderm. The origin of true muscles cells is argued by others to be the endoderm portion of the mesoderm and the endoderm. However, Schmid and Seipel counter this skepticism about whether or not the muscle cells found in ctenophores and cnidarians are true muscle cells by considering that cnidarians develop through a medusa stage and polyp stage. They observe that in the hydrozoan medusa stage there is a layer of cells that separate from the distal side of the ectoderm to form the striated muscle cells in a way that seems similar to that of the mesoderm and call this third separated layer of cells the ectocodon. They also argue that not all muscle cells are derived from the mesendoderm in bilaterians with key examples being that in both the eye muscles of vertebrates and the muscles of spiralians these cells derive from the ectodermal mesoderm rather than the endodermal mesoderm. Furthermore, Schmid and Seipel argue that since myogenesis does occur in cnidarians with the help of molecular regulatory elements found in the specification of muscles cells in bilaterians that there is evidence for a single origin for striated muscle. In contrast to this argument for a single origin of muscle cells, Steinmetz et al. argue that molecular markers such as the myosin II protein used to determine this single origin of striated muscle actually predate the formation of muscle cells. This author uses an example of the contractile elements present in the porifera or sponges that do truly lack this striated muscle containing this protein. Furthermore, Steinmetz et al. present evidence for a polyphyletic origin of striated muscle cell development through their analysis of morphological and molecular markers that are present in bilaterians and absent in cnidarians, ctenophores, and bilaterians. Steimetz et al. showed that the traditional morphological and regulatory markers such as actin, the ability to couple myosin side chains phosphorylation to higher concentrations of the positive concentrations of calcium, and other MyHC elements are present in all metazoans not just the organisms that have been shown to have muscle cells. Thus, the usage of any of these structural or regulatory elements in determining whether or not the muscle cells of the cnidarians and ctenophores are similar enough to the muscle cells of the bilaterians to confirm a single lineage is questionable according to Steinmetz et al. Furthermore, Steinmetz et al. explain that the orthologues of the MyHc genes that have been used to hypothesize the origin of striated muscle occurred through a gene duplication event that predates the first true muscle cells (meaning striated muscle), and they show that the MyHc genes are present in the sponges that have contractile elements but no true muscle cells. Furthermore, Steinmetz et all showed that the localization of this duplicated set of genes that serve both the function of facilitating the formation of striated muscle genes and cell regulation and movement genes were already separated into striated myhc and non-muscle myhc. This separation of the duplicated set of genes is shown through the localization of the striated myhc to the contractile vacuole in sponges while the non-muscle myhc was more diffusely expressed during developmental cell shape and change. Steinmetz et al. found a similar pattern of localization in cnidarians with except with the cnidarian N. vectensis having this striated muscle marker present in the smooth muscle of the digestive track. Thus, Steinmetz et al. argue that the pleisiomorphic trait of the separated orthologues of myhc cannot be used to determine the monophylogeny of muscle, and additionally argue that the presence of a striated muscle marker in the smooth muscle of this cnidarian shows a fundamentally different mechanism of muscle cell development and structure in cnidarians. Steinmetz et al. continue to argue for multiple origins of striated muscle in the metazoans by explaining that a key set of genes used to form the troponin complex for muscle regulation and formation in bilaterians is missing from the cnidarians and ctenophores, and of 47 structural and regulatory proteins observed, Steinmetz et al. were not able to find even on unique striated muscle cell protein that was expressed in both cnidarians and bilaterians. Furthermore, the Z-disc seemed to have evolved differently even within bilaterians and there is a great deal diversity of proteins developed even between this clade, showing a large degree of radiation for muscle cells. Through this divergence of the Z-disc, Steimetz et al. argue that there are only four common protein components that were present in all bilaterians muscle ancestors and that of these for necessary Z-disc components only an actin protein that they have already argued is an uninformative marker through its pleisiomorphic state is present in cnidarians. Through further molecular marker testing, Steinmetz et al. observe that non-bilaterians lack many regulatory and structural components necessary for bilaterians muscle formation and do not find any unique set of proteins to both bilaterians and cnidarians and ctenophores that are not present in earlier, more primitive animals such as the sponges and amoebozoans. Through this analysis the authors conclude that due to the lack of elements that bilaterians muscles are dependent on for structure and usage, nonbilaterian muscles must be of a different origin with a different set regulatory and structural proteins. In another take on the argument, Andrikou and Arnone use the newly available data on gene regulatory networks to look at how the hierarchy of genes and morphogens and other mechanism of tissue specification diverge and are similar among early deuterostomes and protostomes. By understanding not only what genes are present in all bilaterians but also the time and place of deployment of these genes, Andrikou and Arnone discuss a deeper understanding of the evolution of myogenesis. In their paper Andrikou and Arnone argue that to truly understand the evolution of muscle cells the function of transcriptional regulators must be understood in the context of other external and internal interactions. Through their analysis, Andrikou and Arnone found that there were conserved orthologues of the gene regulatory network in both invertebrate bilaterians and in cnidarians. They argue that having this common, general regulatory circuit allowed for a high degree of divergence from a single well functioning network. Andrikou and Arnone found that the orthologues of genes found in vertebrates had been changed through different types of structural mutations in the invertebrate deuterostomes and protostomes, and they argue that these structural changes in the genes allowed for a large divergence of muscle function and muscle formation in these species. Andrikou and Arnone were able to recognize not only any difference due to mutation in the genes found in vertebrates and invertebrates but also the integration of species specific genes that could also cause divergence from the original gene regulatory network function. Thus, although a common muscle patterning system has been determined, they argue that this could be due to a more ancestral gene regulatory network being coopted several times across lineages with additional genes and mutations causing very divergent development of muscles. Thus it seems that myogenic patterning framework may be an ancestral trait. However, Andrikou and Arnone explain that the basic muscle patterning structure must also be considered in combination with the cis regulatory elements present at different times during development. In contrast with the high level of gene family apparatuses structure, Andrikou and Arnone found that the cis regulatory elements were not well conserved both in time and place in the network which could show a large degree of divergence in the formation of muscle cells. Through this analysis, it seems that the myogenic GRN is an ancestral GRN with actual changes in myogenic function and structure possibly being linked to later coopts of genes at different times and places. Evolutionarily, specialized forms of skeletal and cardiac muscles predated the divergence of the vertebrate/arthropod evolutionary line. This indicates that these types of muscle developed in a common ancestor sometime before 700 million years ago (mya). Vertebrate smooth muscle was found to have evolved independently from the skeletal and cardiac muscle types. ^ Mackenzie, Colin (1918). The Action of Muscles: Including Muscle Rest and Muscle Re-education. England: Paul B. Hoeber. p. 1. Retrieved 18 April 2015. ^ Brainard, Jean; Gray-Wilson, Niamh; Harwood, Jessica; Karasov, Corliss; Kraus, Dors; Willan, Jane (2011). CK-12 Life Science Honors for Middle School. CK-12 Foundation. p. 451. Retrieved 18 April 2015. ^ Alfred Carey Carpenter (2007). "Muscle". Anatomy Words. Retrieved 3 October 2012. ^ Douglas Harper (2012). "Muscle". Online Etymology Dictionary. Retrieved 3 October 2012. ^ Marieb, EN; Hoehn, Katja (2010). Human Anatomy & Physiology (8th ed.). San Francisco: Benjamin Cummings. p. 312. ISBN 978-0-8053-9569-3. ^ a b McCloud, Aaron (30 November 2011). "Build Fast Twitch Muscle Fibers". Complete Strength Training. Retrieved 30 November 2011. ^ Larsson, L; Edström, L; Lindegren, B; Gorza, L; Schiaffino, S (July 1991). "MHC composition and enzyme-histochemical and physiological properties of a novel fast-twitch motor unit type". The American Journal of Physiology. 261 (1 pt 1): C93–101. doi:10.1152/ajpcell.1991.261.1.C93. PMID 1858863. Retrieved 2006-06-11. ^ Urbancheka, M; Picken, E; Kalliainen, L; Kuzon, W (2001). "Specific Force Deficit in Skeletal Muscles of Old Rats Is Partially Explained by the Existence of Denervated Muscle Fibers". The Journals of Gerontology Series A: Biological Sciences and Medical Sciences. 56 (5): B191–B197. doi:10.1093/gerona/56.5.B191. PMID 11320099. ^ Farvid, MS; Ng, TW; Chan, DC; Barrett, PH; Watts, GF (2005). "Association of adiponectin and resistin with adipose tissue compartments, insulin resistance and dyslipidaemia". Diabetes, Obesity & Metabolism. 7 (4): 406–413. doi:10.1111/j.1463-1326.2004.00410.x. PMID 15955127. ^ MacIntosh, BR; Gardiner, PF; McComas, AJ (2006). "1. Muscle Architecture and Muscle Fiber Anatomy". Skeletal Muscle: Form and Function (2nd ed.). Champaign, IL: Human Kinetics. pp. 3–21. ISBN 978-0-7360-4517-9. ^ Kent, George C (1987). "11. Muscles". Comparative Anatomy of the Vertebrates (7th ed.). Dubuque, Iowa: Wm. C. Brown Publishers. pp. 326–374. ISBN 978-0-697-23486-5. ^ a b Poole, RM, ed. (1986). The Incredible Machine. Washington, DC: National Geographic Society. pp. 307–311. ISBN 978-0-87044-621-4. ^ a b c Sweeney, Lauren (1997). Basic Concepts in Embryology: A Student's Survival Guide (1st Paperback ed.). McGraw-Hill Professional. ^ Kardong, Kenneth (2015). Vertebrates: Comparative Anatomy, Function, Evolution. New York: McGraw Hill Education. pp. 374–377. ISBN 978-1-259-25375-1. ^ Heymsfield, SB; Gallagher, D; Kotler, DP; Wang, Z; Allison, DB; Heshka, S (2002). "Body-size dependence of resting energy expenditure can be attributed to nonenergetic homogeneity of fat-free mass". American Journal of Physiology. Endocrinology and Metabolism. 282 (1): E132–E138. doi:10.1152/ajpendo.2002.282.1.e132. PMID 11739093. ^ "Concept II Rowing Ergometer, user manual" (PDF). 1993. Archived from the original (PDF) on 26 December 2010. ^ McGinnis, Peter M. (2013). Biomechanics of Sport and Exercise (3rd ed.). Champaign, IL: Human Kinetics. ISBN 978-0-7360-7966-2. ^ Muslumova, Irada (2003). "Power of a Human Heart". The Physics Factbook. ^ Nielsen, OB; Paoli, F; Overgaard, K (2001). "Protective effects of lactic acid on force production in rat skeletal muscle". Journal of Physiology. 536 (1): 161–166. doi:10.1111/j.1469-7793.2001.t01-1-00161.x. PMC 2278832. PMID 11579166. ^ Robergs, R; Ghiasvand, F; Parker, D (2004). "Biochemistry of exercise-induced metabolic acidosis". Am J Physiol Regul Integr Comp Physiol. 287 (3): R502–516. doi:10.1152/ajpregu.00114.2004. PMID 15308499. ^ Fuster, G; Busquets, S; Almendro, V; López-Soriano, FJ; Argilés, JM (2007). "Antiproteolytic effects of plasma from hibernating bears: a new approach for muscle wasting therapy?". Clin Nutr. 26 (5): 658–661. doi:10.1016/j.clnu.2007.07.003. PMID 17904252. ^ Roy, RR; Baldwin, KM; Edgerton, VR (1996). "Response of the neuromuscular unit to spaceflight: What has been learned from the rat model". Exerc. Sport Sci. Rev. 24: 399–425. doi:10.1249/00003677-199600240-00015. PMID 8744257. ^ "NASA Muscle Atrophy Research (MARES) Website". Archived from the original on 4 May 2010. ^ Lohuis, TD; Harlow, HJ; Beck, TD (2007). "Hibernating black bears (Ursus americanus) experience skeletal muscle protein balance during winter anorexia". Comp. Biochem. Physiol. B, Biochem. Mol. Biol. 147 (1): 20–28. doi:10.1016/j.cbpb.2006.12.020. PMID 17307375. ^ Roche, Alex F. (1994). "Sarcopenia: A critical review of its measurements and health-related significance in the middle-aged and elderly". American Journal of Human Biology. 6 (1): 33–42. doi:10.1002/ajhb.1310060107. PMID 28548430. ^ Dumé, Belle (18 May 2007). "'Muscle noise' could reveal diseases' progression". NewScientist.com news service. ^ Seipel, Katja; Schmid, Volker (2005-06-01). "Evolution of striated muscle: Jellyfish and the origin of triploblasty". Developmental Biology. 282 (1): 14–26. doi:10.1016/j.ydbio.2005.03.032. PMID 15936326. ^ a b Steinmetz, Patrick R.H.; Kraus, Johanna E.M.; Larroux, Claire; Hammel, Jörg U.; Amon-Hassenzahl, Annette; Houliston, Evelyn; Wörheide, Gert; Nickel, Michael; Degnan, Bernard M. (2012). "Independent evolution of striated muscles in cnidarians and bilaterians". Nature. 487 (7406): 231–234. doi:10.1038/nature11180. PMC 3398149. PMID 22763458. ^ a b Andrikou, Carmen; Arnone, Maria Ina (2015-05-01). "Too many ways to make a muscle: Evolution of GRNs governing myogenesis". Zoologischer Anzeiger. Special Issue: Proceedings of the 3rd International Congress on Invertebrate Morphology. 256: 2–13. doi:10.1016/j.jcz.2015.03.005. ^ OOta, S.; Saitou, N. (1999). "Phylogenetic relationship of muscle tissues deduced from superimposition of gene trees". Molecular Biology and Evolution. 16 (6): 856–867. doi:10.1093/oxfordjournals.molbev.a026170. ISSN 0737-4038. Look up muscle in Wiktionary, the free dictionary. This page was last edited on 14 March 2019, at 02:27 (UTC).